Time to sell your Island Shores condo? Read about today's resort-market condo buyer. Use our RENTAL TIPS to help boost your Island Shores rental revenue. Use our Alabama Gulf Coast Condo Revenue page to find annual rental incomes for Island Shores and all other Gulf Shores and Orange Beach condos. The building is located half of a mile from the "T" in Gulf Shores and is within walking distance to numerous shops, activities, and restaurants, including the famous Hangout restaurant and bar. 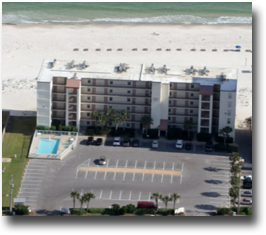 The complex offers great gulf-front views, an outdoor pool, BBQ area, and laundry room. Pets are allowed for the owners. This is the least expensive two- to three-bedroom complex on the entire beach! It is perfect for that first time buyer, providing lower prices, nice rentals, and great cash flow opportunity. Please let us know if you would like further info for Island Shores or any other condos, homes, or real estate along the Gulf Coast or would like to schedule a private viewing by emailing info@condoinvestment.comor by calling (251) Area-Pro (251-273-2776) for immediate assistance.